The Blob is a fritz mini-lure and works superbly when fished very fast but can also be used on different methods of retrieve. The pattern can be tied in a mass of colours from dark to very bright on the colour spectrum. 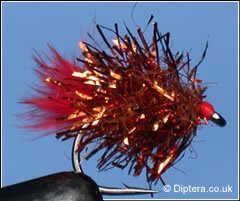 The darker coloured fritz's are usually fished more slowly than the lighter coloured ones. A new method for reservoirs and stillwaters is to fish the blob under a bung or large dry fly static and wait for a take.